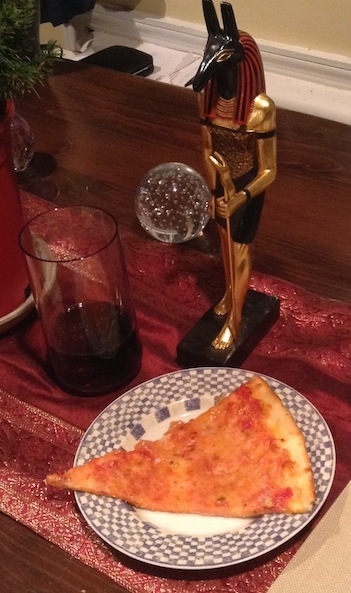 Sharing pizza with the Lord of Storms during the Procession of Set and His Shemsu, on the eve of Winter Storm Hercules. Notes and references follow the ritual. For copyright reasons, placeholder text is used for the incense-lighting prayer; if you don’t have access to the source text, use your own preferred prayer. Advance warnings: This ritual is based on northern hemisphere seasons and is very UPG. Also includes sexual symbolism. Establish two shrines, one for libations and one for Set. 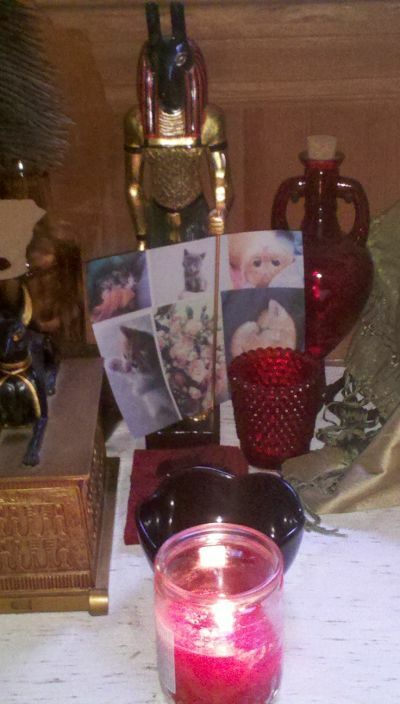 Prepare the “milk of Bast.”* One portion is to be in a glass for offering; the rest in a bowl, with a small red taper candle standing in the center. The milk should be deep enough that the candle flame will eventually be submerged as it burns down. Make the four-fold libation, as in Senut. 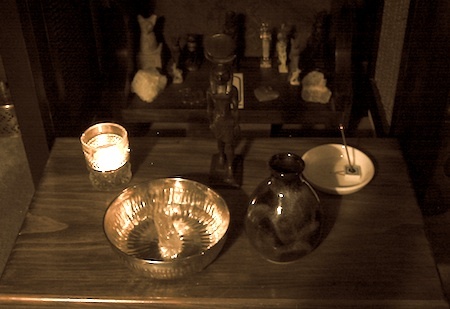 Upon the shrine of Set, light flame and incense. Light the red candle in the bowl of milk. Words to be spoken while offering the milk of Bast. Here is Your milk, O Set! Here is Your sweetness, O Red One! in Her name of Mistress of Joy. bringing You sweetness, bringing You love. Look, here She comes, Her hands full of pleasure. Taste Her milk, close Your eyes. lay down Your mighty scepter. dream of a desert wind. Spend time in celebration while partaking of the offering. Words to be spoken when the red candle has been extinguished. You are pacified, O Set, Lord of Thunder! You are pacified, O Set, Great of Strength! satisfied like Hethert on the field of Iunu. Lay the image of Set down upon His back on the shrine. Remove spent offerings but keep the shrine up until the next day. 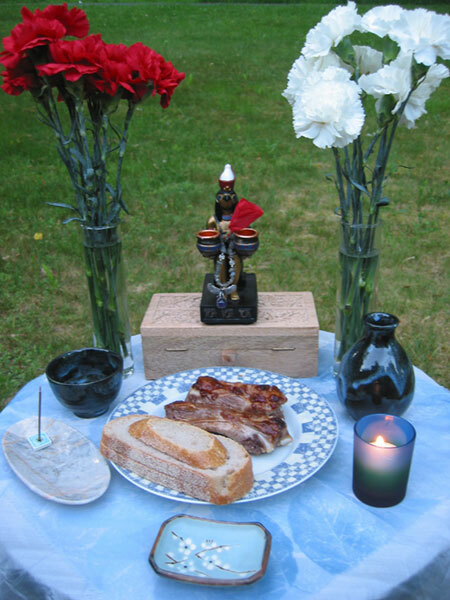 Place flowers upon the shrine; present an offering meal; sing songs and give praises; ask Set for an oracle. Edited to add: I was lucky enough to have a couple of volunteers to help “beta-test” this ritual, and Saryt has posted her experience here! Borghouts, J. F, trans. 1978. Ancient Egyptian Magical Texts. Leiden: E. J. Brill. Google Books preview: http://books.google.com/books/about/Ancient_Egyptian_Magical_Texts.html?id=9f8UAAAAIAAJ. Siuda, Tamara L. 2009. The Ancient Egyptian Prayerbook. New Lenox, IL: Stargazer Design. – Tyet Song, for Aset. – Sa Bast, for Khonsu-Heru, also inspired by the Senut for the Seven Arrows and used in the Full Moon Ritual for Khonsu-Heru. Notes and references follow the ritual. For copyright reasons, placeholder text is used for a couple of prayers; if you don’t have access to the source text, use your preferred flame and incense prayers. Pour a libation of cool water. shining like the plume of Ma’at! Khonsu-Heru, You make us live! Lift our hearts so that we might live! O great disk who illuminates the Two Lands, You are Ra of Upper and Lower Egypt. You rejuvenated yourself that you might go forth upon the lotus in the pool. to travel in accordance with ma’at to the place where Your majesty is. Khonsu-Heru, son of Bast, rise up and take Your two crowns! 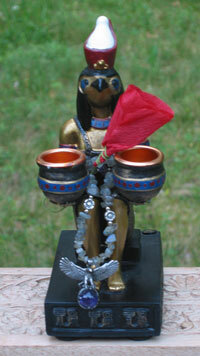 Khonsu-Heru, master of joy, rise up and take Your was scepter! You shine like Djehuty, You shine like Geb, You shine like Ra. it carries You across the sky. in Your name of Khonsu-Heru-Tem. Perform your own contemplations or devotions here. O Khonsu-Heru, may You be satisfied with what is before You! May Your heart be refreshed; may Your ka be pleased. It is come to an end, as shown in writing. So. I don’t know how useworthy anyone else will find this ritual or my thoughts on it, given that I’m just about the only person involved with this particular, rather obscure syncretism, and that both God and ritual are enmeshed in my own still-evolving, very-Bast-centric theogeny and ritual calendar. But it might be of some interest, either as a work in itself or as an example of how one person starts from traditional material to create a new religious ritual. Khonsu-Heru appears to be a relatively late syncretism; He was well known in the Third Intermediate Period and into the Ptolemaic Period (Cruz-Uribe, 186). He was identified as a son of Bast on a naos shrine from Per-Bast (Spencer, 41) and was the fourth of the Seven Arrows of Bast (Rondot, 267). Another attestation is on the gate of Ptolemy III Euergetes at the Temple of Khonsu in Karnak, where He appears as “the left eye who unites with the right eye in the horizon…who takes [the sun’s] place, when [the sun] enters into his mother (Nut)” — in other words, as the moon-son who assumes the role of his sun-father and becomes the king of the Gods in his own right (Kaper, 191-92). In a sense, Khonsu-Heru stands at a point of mythological fusion of the Amun-Mut-Khonsu and Wesir-Aset-Heru triads: Khonsu receives the crown of His father Amun just as Heru-sa-Aset is the heir to the throne of Wesir (Cruz-Uribe, 185-86, 189). The main prayer of the ritual above turns on this idea of Khonsu-Heru coming into His full power and majesty with the appearance of the full moon, and adds a salting of Bast to the mixture as well. The first part (“O great disk…”) is an adaption of text from a Ptolemaic offering scene featuring Khonsu-Heru (Cruz-Uribe, 174); changes to the original translation include a shift from third-person to second-person, a substitution of “son of his father” to “son of Your mother,” and some general reworking (and/or cherrypicking) of sentences and transitions to help smooth out the poetry. This portion evokes the glory of the lunar disk, restored to its fullness and identified with Ra. The second part is my own original text and focuses on the attributes of royalty and purity (crowns, scepter, linen; Gods associated with rulership) as Khonsu-Heru becomes King and sets out on His metaphorical and nonmetaphorical journey across the sky (i.e., both the to-be-continued story of His coming reign and the celestial travels of the moon-barque). Ultimately I address Him as Khonsu-Heru-Tem, Khonsu-Heru the Complete One, who has reached the pinnacle of his power and attainment. The epithets in the song “Sa Bast” (also written by me) are: nefer neb (beautiful lord), sa Bast (son of Bast), and neb awt-ib (lord of joy). One of the things I struggled with for a long time as a Kemetic was what to do about the moon. So many lunar Gods! I couldn’t figure out who I was supposed to talk to when I looked up and saw the moon in the sky. Djehuty, Khonsu, Wesir, Heru…none of them felt quite right. What a change when I stumbled across a mention of Khonsu-Heru, lunar God and son of Bast! My vague but unrooted attraction to Khonsu suddenly hooked up with Bast-the-sun-and-center-of-my-life, and all of a sudden we were in business. Moon falcon, white lion, young bull of the Gods, youthful king in the first glorious fullness of His strength — the electric thrill of bright lunar energy blazing against a black sky, excitement, inspiration, the push to accomplish great things — a cool fire, both healing and invigorating, uncompromising but nevertheless gentle — the son of Bast-of-the-sun-and-stars, of the fiery Eye. Wow! So finally, after taking a little while to get to know Him better (although I still have so, so far to go on that score), I was ready to write my full moon ritual. The result is what you see here. And as a final note, as I was walking to a mid-day appointment today, I heard a hawk crying out overhead, and I looked up to see it circling above me. I was amused, given that I’d just been working on this ritual only minutes beforehand, so I began to talk about it to the hawk, addressing it as if it were Khonsu-Heru. It continued to circle as I spoke, still calling. “Are you satisfied with what I’ve done?” I asked at last, and the hawk turned in the smallest imaginable circle — nearly pivoting on one wingtip — directly above my head. I think I’ll take that as a positive response. Cruz-Uribe, Eugene. 1994. “The Khonsu Cosmology.” Journal of the American Research Center in Egypt 31: 169-189. Stable URL: http://www.jstor.org/stable/40000676. Kaper, Olaf E. 1995. “The Astronomical Ceiling of Deir el-Haggar in the Dakhleh Oasis.” The Journal of Egyptian Archaeology 81: 175-195. Stable URL: http://www.jstor.org/stable/3821814. Rondot, Vincent. 1989. “Une Monographie Bubastite.” Bulletin de l’Institut Français d’Archéologie Orientale 89: 249-270. Available online at http://www.ifao.egnet.net/bifao/Bifao089_art_17.pdf. Spencer, Neal. 2006. A Naos of Nekhthorheb from Bubastis: Religions Iconography and Temple Building in the 30th Dynasty. London: The British Museum. Available online at http://www.britishmuseum.org/research/publications/research_publications_series/research_publications_online/a_naos_of_nekhthorheb.aspx. And I actually recorded and posted the “Singing for the Udjat” song today. In time for the festival, even. The light is already visibly increasing, the sun rising earlier and setting later. It seems to have come sooner this year for some reason. Not that I’m complaining! Or maybe I’m just paying better attention. – “Hymn to Temu in His Barque,” a bit of Kemetic research geekery. Plus I just wrote another one this morning. It started with me singing a little nonsense song to myself about how I didn’t need to take fruit to work because I already had fruit there, and somehow the tune acquired new words and turned into a song for the Udjat “Procession for Singing” celebration, which is part of the Rekeh Wer and takes place today. (My creative process can be very strange.) So…hurray for fruit? With this morning’s song, I’ve now finished 94 songs. Counting the ones that are still in progress, I’ve hit 100. This is extremely mind-boggling to me. Hail to You, Netjer, on Your festival of the Procession for Singing! Thank You for inspiring me with Your beauty and Your love. May I praise You all the days of my life. Dua Set, great of thunder! Hail to You, noble Lord of Storms! May You shelter us under Your arm. O Set, think of the kittens! May You protect us today and every day. Yes, I actually did this. What can I say? Inspiration or ridiculousness — in any case, we came through the storm with nothing worse than inconvenience. our soldiers, our police and rescue workers, our heroes. May You bring light for their eyes. May You bring breath for their nostrils. and every good thing so that they might live. fighting to protect all that they love. until the day when all the lands are forever at peace. and great glory for the courage that they have shown. An offering which the King gives to Heru-hekenu, Son of Bast, at the shrine of Saut-sen Iryt Ra: a thousand of bread, a thousand of barbecue, incense, flame, and cool water for the honored dead of this nation, true of voice. Dua Akhu! May you give your protection and guidance to those who fight today and to all the veterans who have served in the past. May you be remembered for as long as the stars shine in the sky. And may you live. Dua Heru-hekenu! Dua Akhu! Nekhtet! Afterward I sang “Taps” and then sat in meditation until the incense had burned down. It was unusual for me, because I don’t usually do anything to celebrate Memorial Day. But this year it seemed right and necessary, as a sort of follow-on to the celebrations of the Beautiful Feast of the Valley. And it was a lovely moment, sitting outside in the early morning, in the cool air touched by the scent of sandalwood incense, feeling a sense of things in harmony, of ma’at in this kind of remembrance. Heru-hekenu may seem an odd (and obscure!) choice of deity to petition in a ritual like this. It was an intuitive jump at first, but upon further thought it made reasonable sense. As mentioned in the prayer, Heru-hekenu does sail on the night barque with Ra. (In the picture at the head of this page, Heru-hekenu is the hawk-headed figure standing directly behind the ram-headed Ra.) The journey of the sun into darkness and ultimately to regeneration and renewal is also the journey of the deceased; thus Heru-hekenu could be seen in the role of a funerary protector and assistant. According to the Lexikon der ägyptischen Götter und Götterbezeichnungen, He lights the way for the ba of the dead, and He does actually receive offerings in a hotep di Nisut formula (although I’ve written my own here, not having tracked down the original yet). His name is also another indicator — Heru-hekenu can mean “Heru of the unguent” as well as “Heru of praises.” Just as oils and lotions were used to protect the living body against the ravages of a hot, harsh climate, so they were also used to protect the body of the deceased, preparing it for the tomb and its former inhabitant for the journey through the afterworld. Thus Heru-hekenu would be a protector of both the living and the dead. So He seems to have a somewhat more liminal nature than some of the other forms of Heru. Yet he also has that warrior quality, as well as a very primal-seeming raptorial nature, which fits in well with one associated with battle and soldiers. It seemed appropriate, in the end, to call upon Him in remembrance of those who have fought and died for their country, and to ask Him to guard our living heroes as well. A close-up of the statue I’m currently using for Heru-hekenu. The double crown is appropriate — He appears with it in reliefs from per-Bast — and the pots are about as close as one’s likely to find to perfume jars. The necklace draped around Him is one that I made for Him, and the red tissue-paper poppy came from a veterans’ organization.